When Rob Williams, Vice President of Technology at AudienceView, took to the stage at INTIX 2019, he admitted he didn’t know whether his talk would be viewed as a success or a failure. But in foreshadowing what was to come, he reminded the audience that “we define what success is ourselves and we define what failure is ourselves.” It all depends, he said, on our perspective. Whoa! What? Williams certainly knows how to get the attention of his audience. By illustrating his presentation with a series of vignettes about both real and perceived technological failures and successes, the point of it all soon became obvious: Sometimes we are too quick to judge that something has failed, and we do so at our own peril. “For me, this talk is quite a big deal,” says Williams. “This is my second appearance at an INTIX event and like a difficult second album, this needs to be just as good as the first one,” an approach which, he almost immediately concedes, could be setting himself up for that very thing he is hoping to avoid. “It wouldn’t take a lot to turn this into a failure itself,” he says, adding that he’s not worried because of his ability to define both success and failure. “It’s really important in business that we understand what we mean by failure. The only way to do that is to first define our criteria for success for any particular project. It’s not always about whether it hits its budget. Failure can actually be a really great way to learn,” says Williams. Perhaps, nowhere is this adage more appropriate than in technology. Williams gave the example of a big company that wanted to change the words on a website button from “Buy Tickets” to “Find Tickets,” figuring the latter was more customer-friendly language. They were told that extensive research shows “Buy Tickets” is more effective. Still, they insisted on a change, but at least agreed to test it out first. After two weeks of multi-variant testing, they had lost 50,000 pounds ($65,000) in revenue. A miserable failure. Or was it? Indeed, instead of focusing on the obvious failure, she highlighted the success that came out of it. Had they just gone ahead and made the original change, they would have lost far more money before they figured out what was wrong. Now they knew for certain that sticking with “Buy Tickets” was their best option. Remember Google Glass? Williams certainly does, having been one of those who paid several thousand dollars to be on the cusp of what promised to be a revolution in interface technology, only to see it drop out of sight as quickly as it appeared. Another miserable failure? Ah, no. According to Williams, Google Glass was an experiment with a limited test market designed to discover the world’s attitude towards the technology, privacy and wearability among other things. All the data they gathered over several years is helping refine Google Glass for the future. “Google Glass was a roaring success for Google, yet we're really quick to pin that as a failure,” says Williams. He then went on to list all kinds of other perceived failures that are, in reality, great successes. This includes everything from digital music — which is perceived to be failing because of a minor resurgence in vinyl — to e-books — allegedly failing because of screen fatigue when in fact sales are at an all-time high. Just as hype can turn something unknown into an overnight success, so can it make success look like a failure. Williams points to blockchain as an example. Blockchain was created as the underlying technology for the transfer of Bitcoin. There was no other apparent use for it. But then someone gets another idea for how it might be used, the media gets wind of it, and then everyone is talking about it as if it’s the one thing that will solve every problem. In ticketing for example, you’ll have no touts and you’ll know where every ticket is every single day. Yet it’s not the actual use of the technology that is causing the excitement, notes Williams, it’s only the potential of the technology. So the story dies down, everything goes quiet and there is a perception that blockchain was an idea before its time or maybe even a dud. Meanwhile, behind the scenes, lots of people are beginning to figure out how to use the technology and before you know it, it’s a roaring success. 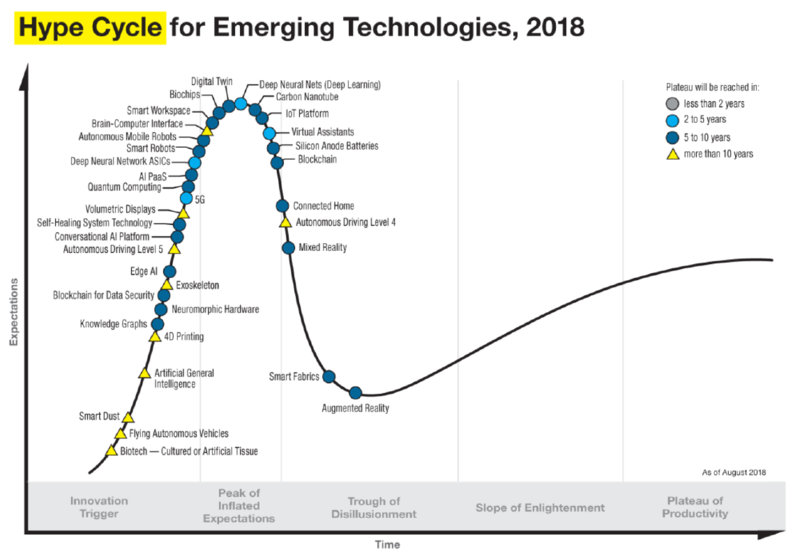 Williams says this is all part of Gartner’s "hype cycle" in which new technology pops up, reaches a peak of expectation, then falls back into a trough of disillusionment, before rising again along a slope of enlightenment until it becomes part of the mainstream. Remember when cloud computing was just an idea not even a decade ago? 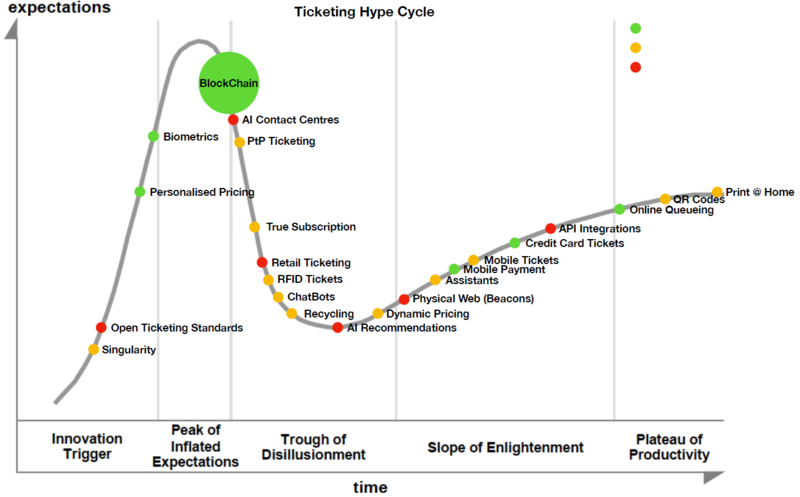 When it comes to ticketing, Williams has created his own hype cycle. And blockchain is front and center. Williams, recognizing that some still don’t quite get it, gives a quick, easy-to-understand description of how it could streamline the entire ticketing process, with no actual ticket anywhere in sight. By now, everyone has at least heard of dynamic pricing — and many organizations are already using it to boost revenue. But there is something else waiting in the wings, according to Williams, and that’s personalized pricing. 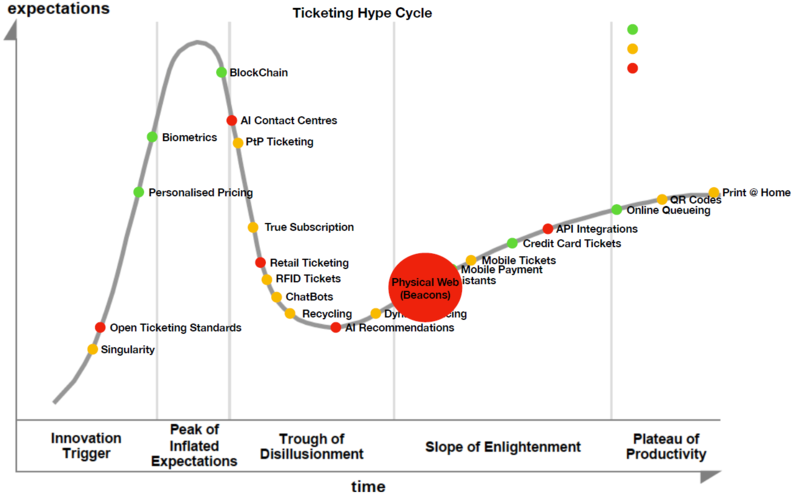 Right now, Williams believes personalized pricing hasn’t even hit the hype cycle yet. And then there’s biometrics, which still isn’t quite at the top of the hype cycle, but it is moving up very quickly, says Williams. Biometrics is the concept of not using a ticket or even a phone to access an event. It’s the concept of using a fingerprint or a faceprint. Williams says the technology is now cheap and secure enough to go mainstream. Williams says he wouldn’t be surprised to see the number of exhibitors and attendees talking about biometrics grow substantially at INTIX 2020. Williams goes on to talk briefly about various other technological advancements such as QR codes and beacons, which you stick on things so that phones and apps can react to them. An example would be that you walk into the Apple store with the Apple app open, and it would welcome you to the store, then give you information about a specific Mac when you are looking at it. So, what happened? 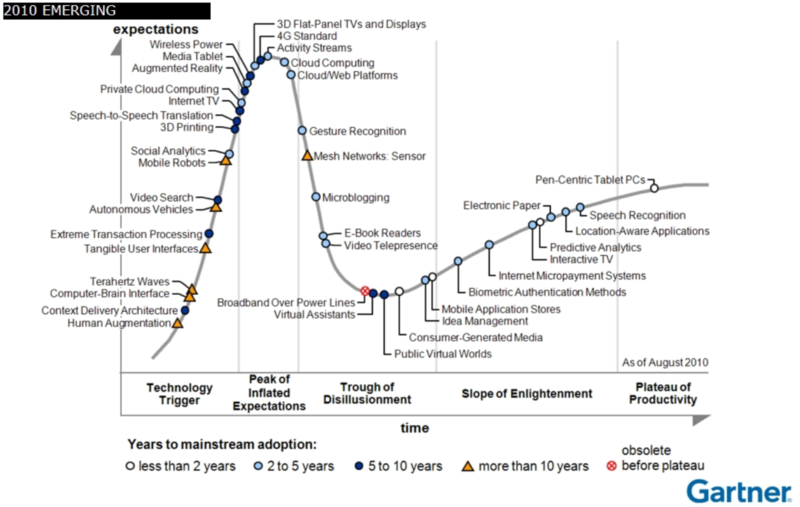 After the initial hype, beacons fell into that trough of disillusionment. Williams says there are two ways to look at how you can embrace failure — one is when you are looking internally at your organization and one is when you are looking externally at technologies used in your industry. When you are looking internally, he says, it’s really important to embrace failure, to admit your mistakes and learn from them. “I think it’s really important to embrace failure…in the same way we embrace success. Make sure you learn from every failure. Every time something goes wrong, just think to yourself, what have I learned here, not what would I do differently. It’s different than trying to fix the problem. Where can I use that experience in the future? Be smart about your definition of failure and your definition of success,” he says. And externally? When you are looking externally, at the great big world out there and our industry, Williams says you shouldn’t be too quick to presume failure. Look past the failure. Was this really just about hype? Has it really failed or is it just that we now have lots of people working behind the scenes, trying to iron out the kinks before something truly does become the next big thing? Time to come full-circle. Do you recall how Williams’ presentation began? It had something to do with everyone in the audience being out of a job in five years. A startling prediction for sure, but one which Williams sees us all waking up to one day, depending on how we learn to handle failure. After saying good morning to him, Williams’ phone tells him that one of his favorite bands is playing tonight and asks if he’d like to go. Williams says yes, that would be great. His phone asks if he wants to invite his wife. He says sure and then goes off to work without giving it another thought. When he’s finished for the day, Williams meets his wife at the venue and they enjoy the performance. So, what just happened? Siri was searching the Internet while Williams was sleeping. She knows what bands he likes because it’s all tied in with Apple Music. That, says Williams, is the future of ticketing — a seamless technological experience with no human involvement. This means that most of today’s jobs as we know them would no longer exist. Indeed, as INTIX President and CEO Maureen Andersen has said many times before, we are the magic behind the button. Are We Becoming Human Tickets?